First time deck creator, Elijah, is 11 years old. 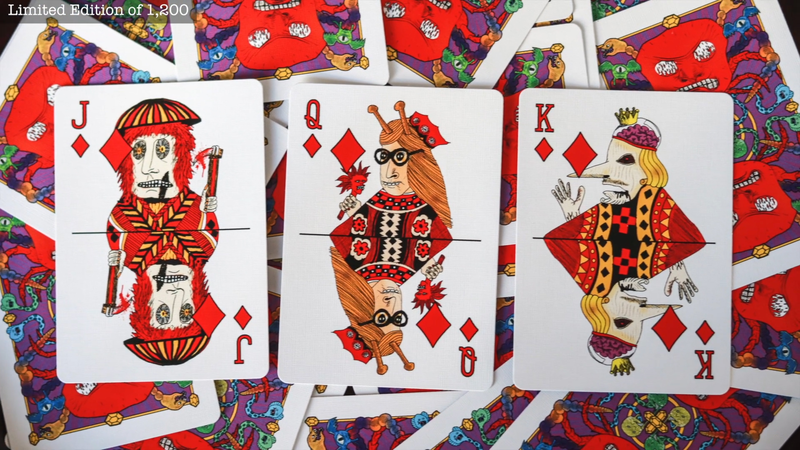 It took him over 3 months to create the Ghoul Guys Playing Cards with unique ghouls on every card! He worked on the illustrations after he came home from school and during the weekends and holidays. Elijah spent a lot of time imagining and drawing all of these ghoul guys. He never lost the motivation and the passion during the entire process of creating his first deck of cards. Elijah did all the drawings using pens. Black lines on white paper. He then scanned them into his dad's computer. With the help of his dad, they then did all the coloring in Photoshop. They then inserted each finished drawing onto each card to determine which one would fit best with each card. After much experimentation, they finally decided which drawing would accompany each specific card. But that's not all! They then had to decide how to insert the drawings around the pips. After a prototype deck was printed, further minor adjustments were made.